A 77 page in depth analysis of the then proposed IUSA/UIL merger. The report analyzes the issues of concern during the merger process in the summer of 2015. 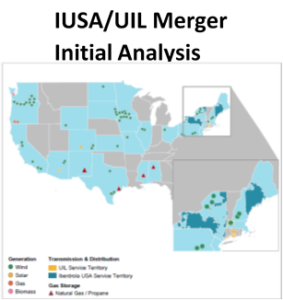 Report contains: preliminary earnings and valuation estimates; background information about all of the subsidiary utilities, with historical customer counts and sales volumes; regulatory review of the four state jurisdictions; listing of all wind projects owned by IUSA, including size, location, date in service, and generating volumes; accounting review discussing the potential impact of IFRS vs. US GAAP accounting, as well as pro forma financial statements.